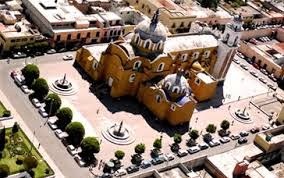 Huamantla (from Nahuatl, means "tree-lined Place" or "Place of the trees together") is a colonial city founded on October 18, 1534, is located approximately 40 kilometers from the state capital, has a population approximately 80,000 inhabitants. In August 2007 he was enrolled in the Magic Towns program. Tlaxcala is a city with a wealth of history; matchlessly also has a beautiful natural wealth. The word comes from the Nahuatl Tlaxcala tlaxcalli you mean omelette, but when combined with the Tlan ending denoting "instead of" form Tlaxcallan, the noun comes to mean instead of tortillas. Xicoténcatl is in honor of Tlaxcala hero who fought against the Spanish invasion. According to some historians, the name of Tlaxcala is derived from the primitive root Texcalli, meaning rock, and Lan termination is equivalent to place together mean "the rock"; probably because the first place came the tlaxcaltecas went to the top of a hill.Malinalli Tenépatl, also known as Malinche, Malinche or Doña Marina (c.1502 - c.1529), possibly born in Copainalá, Chiapas, perhaps in the upper class of Mexica society. According to Bernal Diaz del Castillo, Malintzin parents were lords and chieftains of a town called "Painala". Gómez de Orozco historian assumes that the name of his father was pointing as "Chimalpain" ie, "Malintzin Tenepal". This was a noble chief lord who married, according to custom, with a "lady of vassals and States", also of noble origin, called "Cimatl" cacique of Xaltipa, which reportedly was "young and beautiful". Holidays and TraditionsCarnival in Tlaxcala, dating back to colonial times, although currently endure details Prehispanic times. Carnival takes place four days before Ash Wednesday. Comprised of litters (dance group) of huehues (dancing in the singular), who dance in the streets and town squares for long periods of time; basic costumes are 6: Charros: Papalotla, Mazatecochco, Acuitlapilco and Tepeyanco. Catrines: Santa Cruz, Contla and Panotla. Built on a temple of the XVI century. Palafoxian retains the Baroque façade with neoclassical interior of the nineteenth century; one Baroque chapel, an image of the Virgin of Guadalupe working on pieces of seashell, like a chapel dedicated to the Holy Child Miracle of Tlaxcala. Considered one of the first four convents in mainland of America, 1524-1540. Wooden coffered ceiling preserves and the first pulpit of New Spain as the stack where the Catholic faith were the four lords of Tlaxcala.BULL RING JORGE AGUILAR "RANCHER"
It is located in the municipality of San Pablo Apetitlan; with more than 480 species: reptiles in the region. Tropical animals, savannah, forest, desert and nocturnario.NATIONAL FAIR TLAXCALAAccording to a document dating from 1826 and guarded by the historical record of the state, in which "the C. President, General. General Guadalupe Victoria and Congress determined that" the Territory of Tlaxcala is granted for 10 years, a fair Annual "and considering the Fair City of Tlaxcala, one of the oldest in the country. This celebration takes place in the months of October and November, is a sign of economic, agricultural, livestock, industrial, craft and state tourism development, and strengthen the image of Tlaxcala as an appropriate entity for investment. From this wonderful Mexican destination, you'll enjoy this magnificent celebration that we have become the ideal to live and share with our families and friends space. You spend long hours of entertainment, adventure extreme games, the delights of Tlaxcala kitchen, lacking of course, the international shows, cockfights, livestock and industrial exhibitions, bullfights, make your fun reach the maximum .